Get ready to whoop it up! We're celebrating 10 years of #RHOC goodness. Pick your favorite Housewife and find out what it reveals about your own personality. RHOC Housewives, producers, and the director spilled what was really happening behind the scene of that infamous wine toss. When "Woo-hoo" turns into "I have never had multiple partners!" 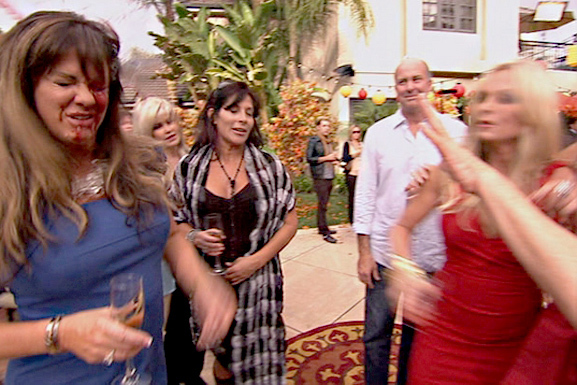 Oh how time has flown since Season 1 of #RHOC. Unseen Moment: Gotta Get to Andales! As producers will tell you, there's no stopping Vicki Gunvalson from going to Andales. You'll never want to forget about these early #RHOC moments again. From the group trip to Ireland to a dune buggy accident, here are the 9 moments that have us ready for more! These walks down the aisles are perfect for a walk down memory lane. Trust us, there were plenty to choose from. See how the OC Housewives' interview style has evolved through the years. The #RHOC alum opened up exclusively about her life after she left the show in 2007.